Most things in here should feel pretty familiar. 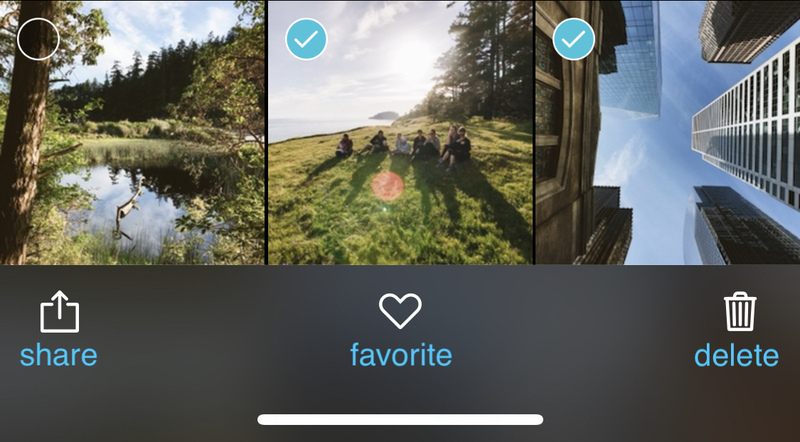 Across the bottom, you can choose to view the camera roll, videos, or your favorites. The camera button at the top-right takes you right back to the camera to take more photos or videos. Select at the top-left allows you to select a bunch of photos to either share, favorite/unfavorite, or delete them. You can also access this mode by lightly long-pressing on any of your photos. The buttons at the top will change to clear and done. Clear will clear all of your selections and done will simply exit the Select mode. Once you're looking at a photo in more detail, we offer a few new options. You can pinch to zoom, swipe up to view the metadata, and we even have button to edit in Darkroom if you have their app installed. Swiping left or right will take you to the next or previous image. To leave this view, press the back arrow in the upper-left corner, swipe down on the photo, or press the camera button to return to the camera.